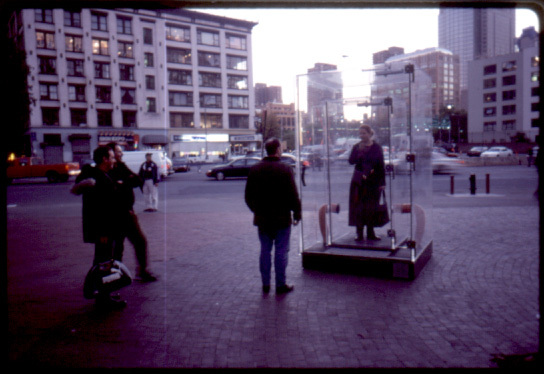 Commissioned by Art In General to create a “sound piece” for the 25th anniversary of the organization, this seemed redundant on Canal Street one of the noisiest locations in New York City. Hamilton instead chose to “erase” the sound in a small area selected as one of the noisiest as it sits at the convergence of all traffic headed to the Holland Tunnel. This clear plexiglass soundproof booth provided a respite from the cacophony while still affording visitors a full 360 degree visual experience of the surroundings. 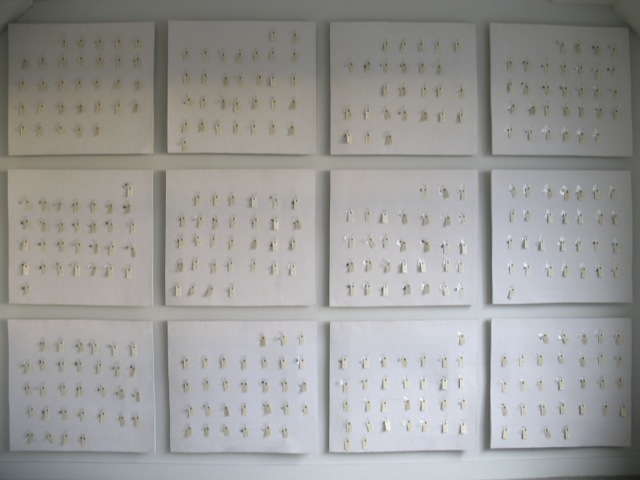 The piece measured 5 feet square and over 8 feet tall and weighed nearly 2000 pounds. 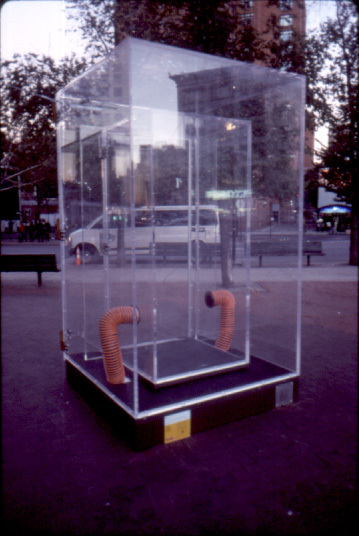 It was installed in Duarte Square at the corner of Canal and 6th Avenue and was selected in 2007 as the representative piece for 2001 in the NYC Park’s Departments exhibition of “25 Years of Art in the Parks”. 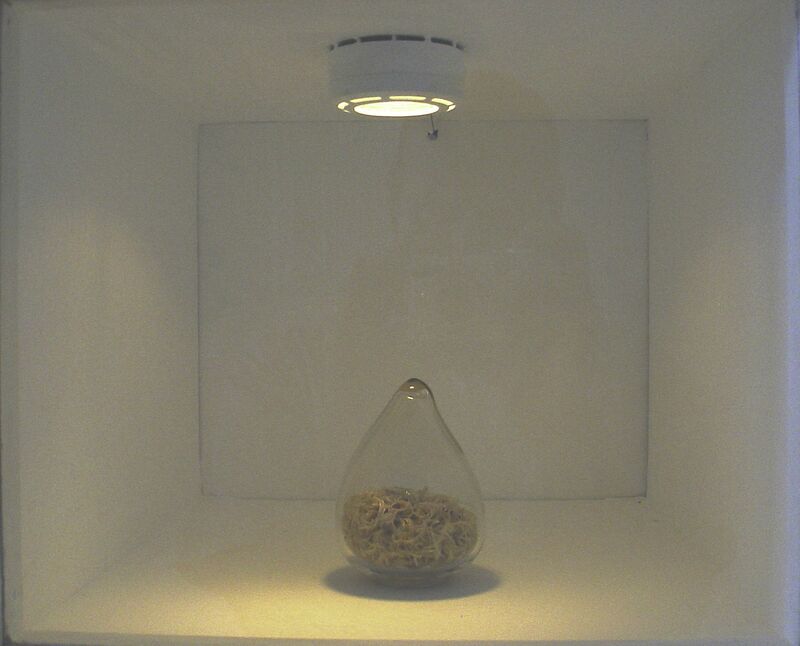 2 Channel video w/sound sculpturally contextualized with glass teardrop vessel containing 10 years of the artist’s finger and toenail clippings. 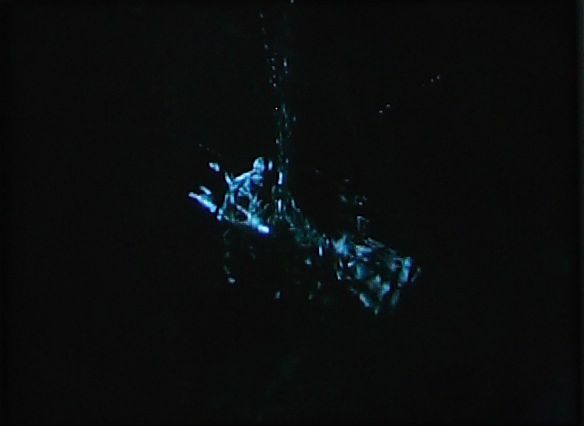 Structure features surface depth installed monitors with upper channel depicting a still life shot out artist’s studio window with a perpetually and gently windblown chain brushing lightly against the window frame, while the lower channel depicts water dripping into a black void creating a shimmering pattern mimicking sound waves as indicated in drawings and cartoons. Entire structure mimics a large hourglass and runs continuously in two random loops. 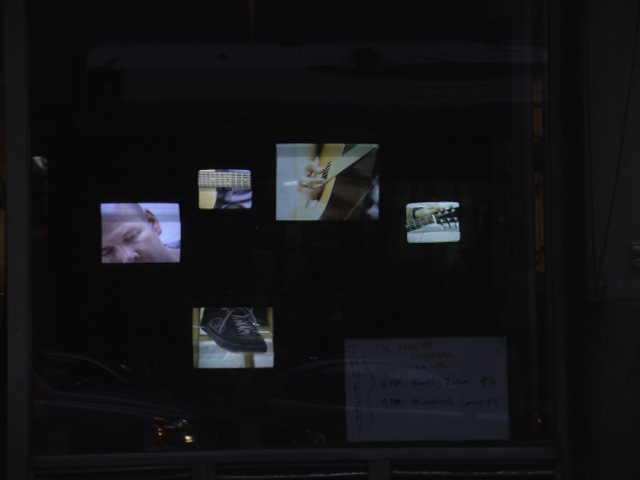 Single channel video w/sound emerging from the artist’s early explorations in the relationship of sound and image as well as the substance of sound and the metaphysics of perception. 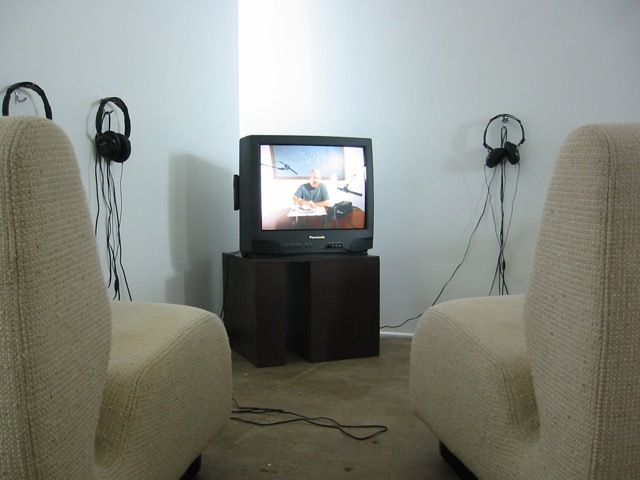 Installation includes a video monitor and multiple headphones which allow for an “immersive” experience in the sonic substance created as the artist consumes a caesar salad with crunchy croutons. 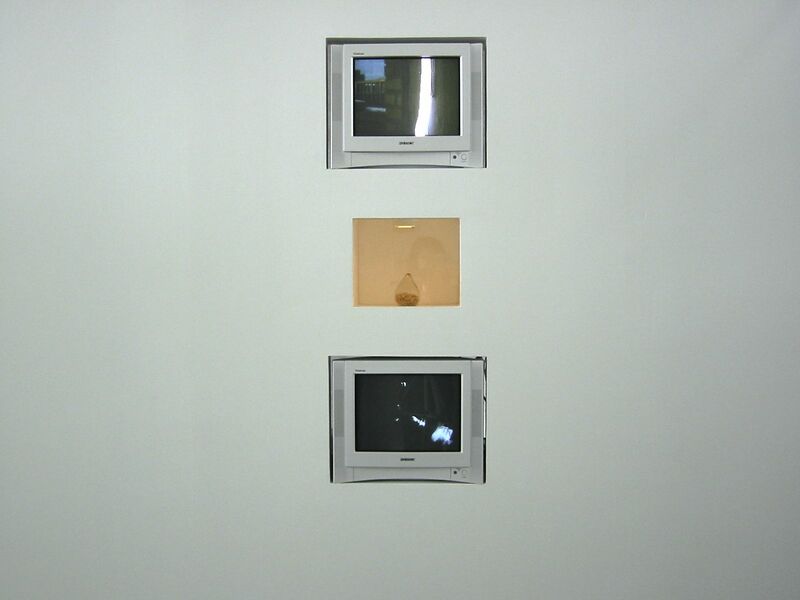 Recorded with three microphones one directed at the artist’s head, one directed at the ambient room, and one in a separate room with a dripping faucet. 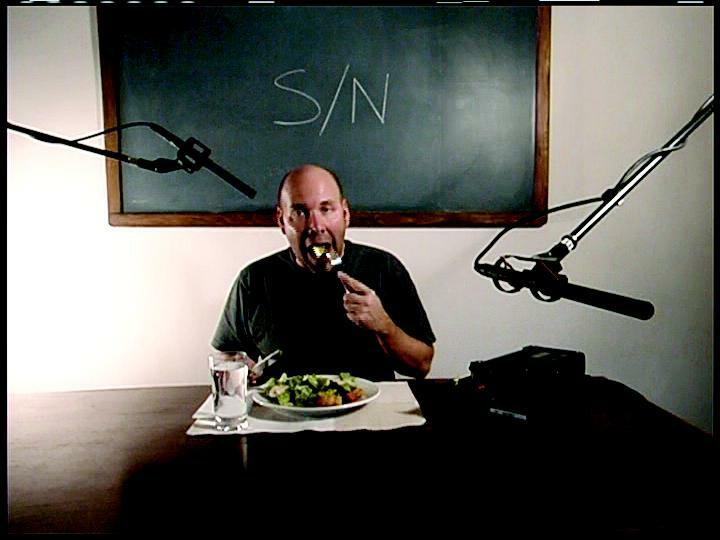 As the video progresses the viewers perception shifts from salad, to room, to distant ambience. 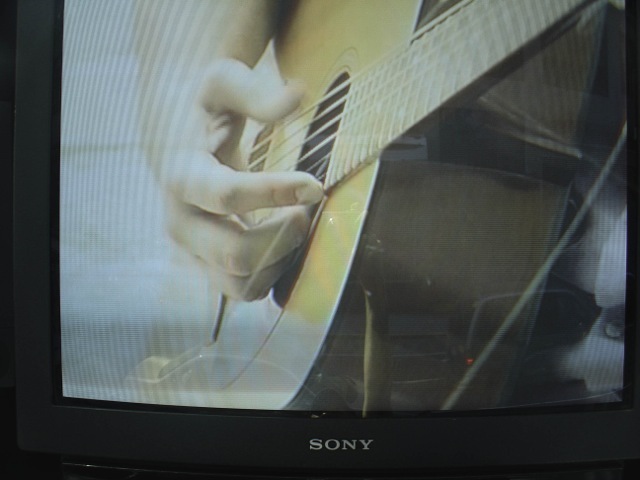 5 Channel video with sound of a performance in which the artist tightens the strings on a guitar while tunelessly but decisively plucking them until each in it’s turn finally breaks. Collectively this deconstructed self portrait depicts a fractured and frustrated state of mind which nonetheless demonstrates the artist’s ability and hope to carry on. 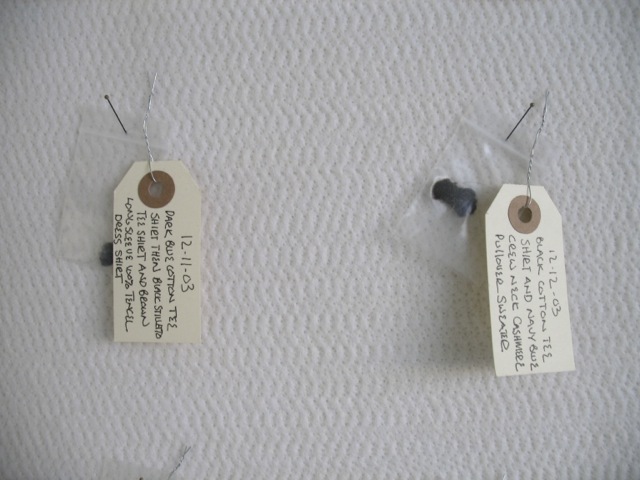 Full year calendar created from the artist’s belly button lint, collected and catalogued into ziplock drug baggies with manila and wire tags and pinned with morpho insect display pins to 1 inch thick industrial machine needled felt. Upon completion it was discovered that three days in September were missing (a Friday, Saturday and Sunday) prompting the name change from The Last Year of My Youth to the current title. 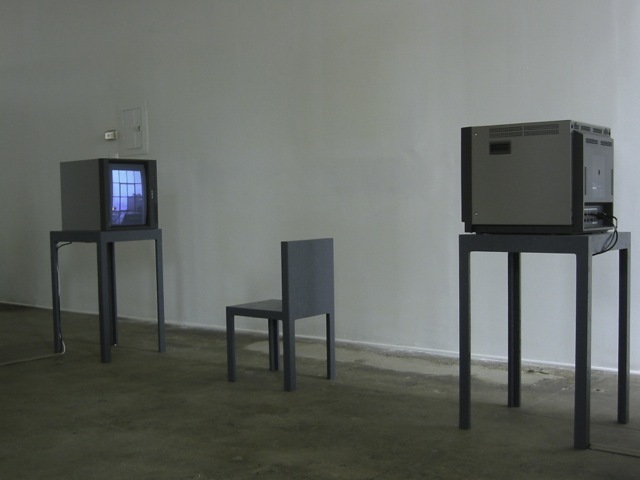 Two Channel video sculpturally contextualized by two pedestals and a chair which “encourages” the viewer to sit facing the Western view. 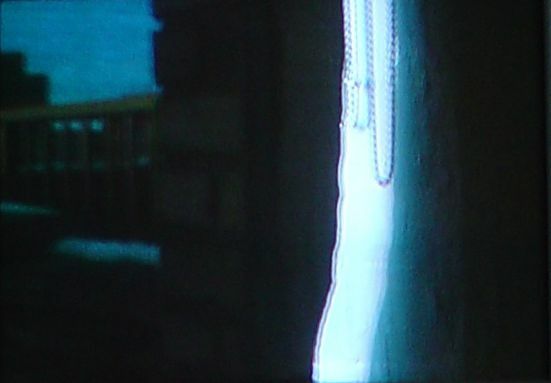 Shot simultaneously, the eastern screen depicts the rising sun viewed through a 2 inch hole bored in the foot thick wall of the artist’s studio while the western view is across the Hudson River as the moon is setting. The hole in the eastern wall evokes a feeling of shrapnel and the damage of warfare, while the monitor depicting the western view lies on its side.